Claudio Orlik has been a fixture on the cross golf scene for many years now. The 42-year-old is a member of the German national team, winning a European cross golf runner-up medal in 2016 as an active player and becoming European champion in 2017 as the team manager. The tournaments are organised by the Urban Golf Collective – the world federation of cross golf, so to speak, which is run on a voluntary basis. Orlik’s appearance reflects the character of the sport: long white beard, undercut hairstyle, upper-arm tattoos, sunglasses usually on and cheeky Berlin attitude – though he’s always friendly and open with everyone. He reminds us a little of Magnus Walker. So basically: the Urban Outlaw of cross golf. There are no labels or dress code. Together with Claudio, the Porsche Newsroom invited six German online media presences to take a closer look at the sport. “Anyone can play,” Orlik reminds the participants before we start. Your age is just as unimportant as where you come from or whether you’ve played before. This is also reflected in the group, which represents travel, urban culture, photography, men’s affairs, entertainment and also golf in particular. The Porsche Cayenne is selected as the mobile base. “A good choice,” says Orlik. 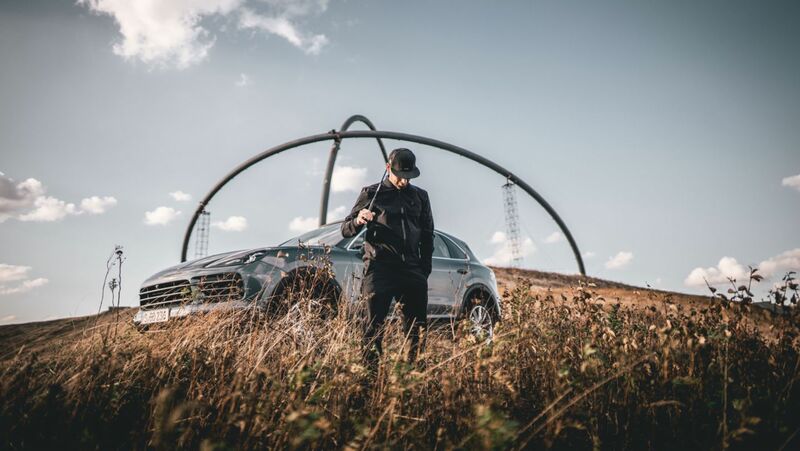 “The car has enough space for our golf bags, it’s as sporty as we are and it can also take us offroad to the best spots.” The cross golfers immediately got an opportunity to test what the Cayenne can deliver away from the asphalt, on the offroad site of Porsche Leipzig. On gravel or sand, through ditches or over sloping tracks, the Cayenne progressed smoothly through the unpredictable terrain. Even an incline of 80 per cent was no problem for the offroad vehicle with its 324 kW (440 hp; Cayenne S: combined fuel consumption 9.4 – 9.2 l/100 km; CO2 emission 213 – 209 g/km). The driving test was interspersed with short rounds of cross golf to get everyone warmed up. “The cars are not at risk,” Orlik assures us, because at 13 grams an cross golf ball weighs only about one third of a normal golf ball and is made of hard foam. So dents or smashed windows are not a concern. Nevertheless, rule number one of cross golf still applies: Safety first! “We’re out to have fun, not to endanger anyone or anything.” This is always kept in mind when selecting an cross golf course. After the cars and participants have been tested in offroad mode, we moved on to the next stages of the #PorscheCrossdrive road trip. And these were as varied as the sport itself. …or at the windmills of Zaanse Schans near Amsterdam. In contrast to classic golf, the play seldom revolves around holes. The targets are usually objects that have to be hit with the cross golf balls. And these targets can be anything from dustbins to signs to tree trunks. The paths to the objects also depart significantly from the rules of conventional golf: the more contorted the better. Wide open spaces are rather boring as the goal is to reach the target with as few strokes as possible. On the last stage of the #PorscheCrossdrive all of the participants are swinging their clubs almost like pros, but more importantly they’ve internalised the spirit of the sport: Have fun, be open, show consideration. Anyone interested in seeing more of this trending sport has the opportunity on 22 September in Paris, a week before the Ryder Cup, where the first ever World Urban Golf Cup will be staged. Claudio Orlik will be present once again as manager of the German national team.